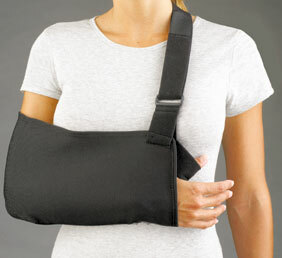 The ProLite® Universal Arm Sling comfortably supports the weight of the arm following injury or surgical treatment of the arm, hand or shoulder and can be worn with or without a cast. Soft, durable sling material with padded, adjustable shoulder strap. Thumb loop limits wrist drop and prevents migration. Universal design fits a range of sizes and right or left arm. Black color hides dirt.